Grangetto's Farm and Garden Supply Services - » Tomatoes and Onions and Cukes, Oh My! Tomatoes and Onions and Cukes, Oh My! What Do You Do with All Those Extra Fruits and Veggies? You love growing your own produce; it’s healthier, you save money, and it’s fun! But, as any gardener knows, you always end up with way too much come harvest time. Even the healthiest eating family tires of zucchini pancakes, zucchini fritters, zucchini parmesan and more when it’s served every day of the week. So, what do you do with all those extras? There are several things you can do to use up all those delicious fruits and veggies, which is great news, because nothing is better than growing your own! 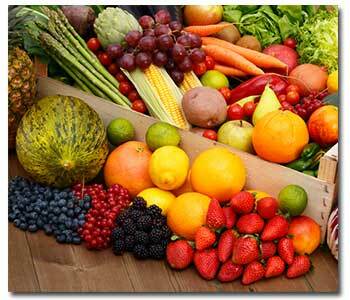 One of the easiest things is simply to eat more raw fruits and veggies. Don’t reach for the potato chip, go out and grab a fresh green pepper or a couple carrots. They’re crunchy, they’re delicious, and they’re good for you, too. Nothing tastes quite as good as an entrée salad, fresh from the garden. Add some fresh mozzarella, a vinaigrette made with your own herbs, and bon appétit! Years ago before refrigeration, our ancestors perfected the art of canning food. By doing some simple processing, depending on the food, and sealing it in an air-tight container. Canned food lasts a long time on the shelf so you can enjoy it long after growing season. As mentioned earlier, canning is an art; if the jars aren’t sterilized just so and sealed just right, you could walk into your pantry expecting delicious tomato sauce only to find a soured mess. Don’t let that scare you; there are local classes to teach you how, not to mention several good books. Another healthy alternative is making delicious and nutritious juices with extra produce. Fruits and veggies make excellent juices – even mixed together – and there are several affordable juicers on the market. A personal favorite is beets, apples, and carrots; it’s a sweet sensation! Smoothies are a close relative of juices. These yummy concoctions can be made in your blender – or any number of specialty appliances. Essentially, smoothies are fresh fruits and/or veggies, typically some ice, and maybe some yogurt or protein powder. They’re a meal on the go and perfect for post-workout refreshment. Oh No, Not Zucchini Tetrazzini Again! There are recipes and there are recipes. Once you’ve run the gamut from zucchini break to zucchini waffles, with a little research, you can still come up with new, delicious recipes for that extra produce. There are many vegetarian magazines and cookbooks with imaginative recipes that will make your family happy to see extra zucchini on the vine. Almost everyone loves a hot bowl of soup. The good news is many vegetable soups freeze very well. If you have favorite recipes, or find some new ones, spend a day making a pot or two (or three) of soup, eat a little and freeze the rest. You’ll have healthy “fast food” waiting for you in your freezer, year-round. …to eat a garden. This last idea is a great way to help out neighbors, friends, and family members who don’t garden, yet love fresh produce. Share! Put together a selection of fruits and veggies and give them away. Not only does that solve your surplus issue, but the receivers get great, nutritious food, and save money at the grocery store. You’ll be everyone’s favorite gardener in no time!